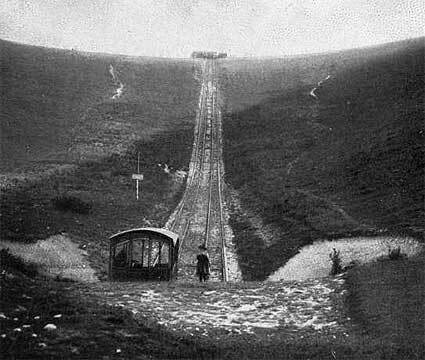 Long vanished Steep Grade Railway and cable car at Devil's Dyke, Brighton. 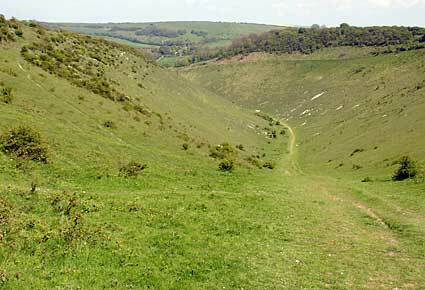 The National Trust-owned Devils Dyke covers some 200 acres of downland scarp, and includes the deepest dry valley in the world - created when melting water eroded the chalk downland to the permafrost layer after the last Ice Age. 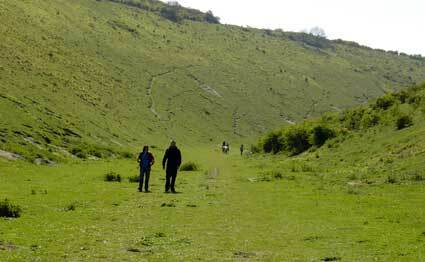 The three-quarter mile long curved dry valley is around 700 feet in height and affords splendid views into Sussex, Hampshire and Kent. 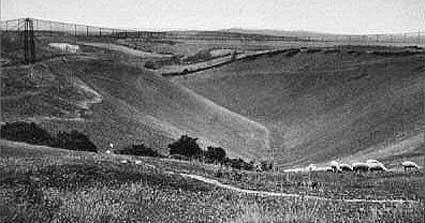 Such distinctive topography proved attractive to tourists, and in August 1887 a single track railway line opened up from nearby Brighton to transport sightseers to the foot of the hill. 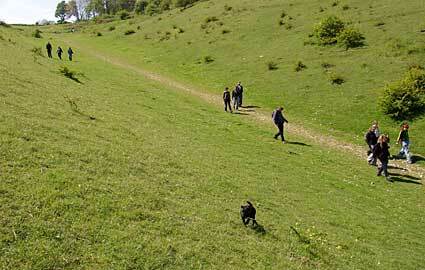 During its heyday, Devil's Dyke was a huge hit with Edwardians, with 30,000 people visiting on Whit Monday in 1893. 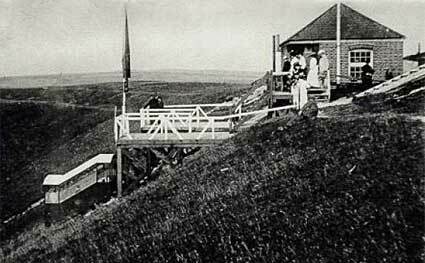 In addition to the Steep Grade Railway, other attractions included two bandstands, an observatory, a camera obscura, fairground rides and, later, a switchback railway and an aerial cableway railway across the valley. Old postcards of the 1900s also show a huge wooden cannon which seemed to serve no purpose whatsoever. A local hotel run by a James Hubbard put on entertainment for visitors including fairs, bands, fortune tellers and even published a newspaper called The Devil�s Dyke Times, costing one penny for sixteen pages and claiming to have a circulation of one million! 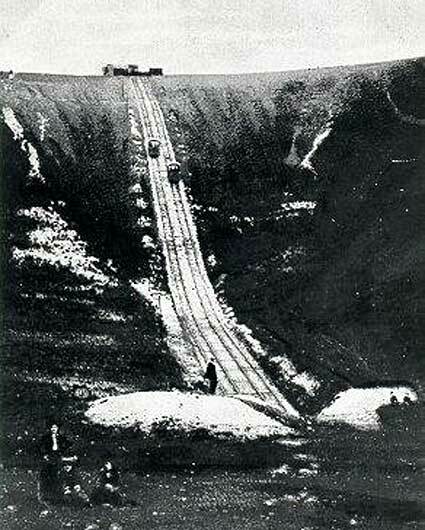 With the growing popularity of the train service, promoters looked to further exploit the tourist traffic with a 'Steep Grade Railway' descending down the north face of the Downs towards the village of Poynings. (Pic from postcard view, circa 1900). Opened on the 24th July 1897 the railway ran for a distance of 840 feet, with carriages running on three foot narrow gauge railway tracks. Unusually for a funicular-style railway, the track gradient was not constant so the two cars had to be run independently. (Pic from postcard view, circa 1900). A small crowd of passengers gather at the station at the head of Devil's Dyke (Pic from postcard view, circa 1900). Sadly, the line never prospered, closing after only ten years or so. A contemporary view of the Dyke which once proved such a popular tourist attraction. The branch line from Brighton also succumbed some time later, ceasing operations on 31st December 1938. Designed and built by William Brewer in 1894, this cable railway over the Dyke was made from 1,200 feet of cable, suspended precariously 230 feet above the valley floor on cast metal supports. Two cars, each carrying four passengers, were pulled across the ravine by a cable worked by an oil engine. Like the railway, its popularity was short-lived, opening on the 13th October 1894 and carrying its last passengers around 1909. Modern view from the same angle. Anther contemporary view showing the impressive height of the valley walls - it must have been quite an experience to whirr over the valley floor in a little cable car!